Application and Futuremark Performance - Logic Supply LGX AG150 Fanless System Review: Cedar Trail or Cedar Trial? Logic Supply LGX AG150 Fanless System Review: Cedar Trail or Cedar Trial? It's unreasonable to expect that the Logic Supply LGX AG150 is going to set the world on fire with its performance, but it's important to understand that it's not supposed to either. The LGX AG150 is designed to fulfill a specific purpose: offering x86 performance in a fanless enclosure for commercial and industrial applications where performance is a secondary priority to connectivity and x86 support. Nevertheless, let's put performance in perspective with a few different systems. 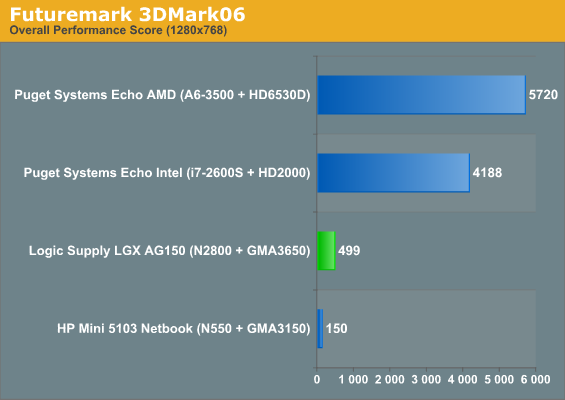 Amusingly, PCMark 7 just crashes outright on the LGX AG150's Atom N2800, and 3DMark 11 won't run due to the lack of DirectX 11 support (much less the lack of DirectX 10 support that prevents 3DMark Vantage from running). 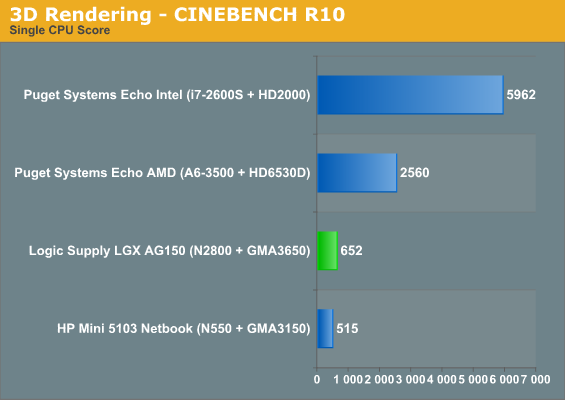 The GMA 3650 lives up to Intel's claim of twice the performance of the old Atom's GMA 3150 and then some. The problem is that Intel could've claimed ten times the performance and it still would've been dire. The difference in performance between the N550 and the new N2800 basically lines up with the 366MHz difference in core clocks between the two models. You want to be more impressed by the improvement in performance within thermal envelope; after all, the N2800 is able to get a decent boost in clocks over the N550 while reducing TDP by two watts. The problem is that Intel hasn't changed anything in the architecture since it was introduced. It's not hanging that badly when you consider the top two chips on the list pull ten times as much power, but we know things can be better. Imagination never supported open source drivers for their GPUs, and 3rd party driver support tend to be messy to begin with... 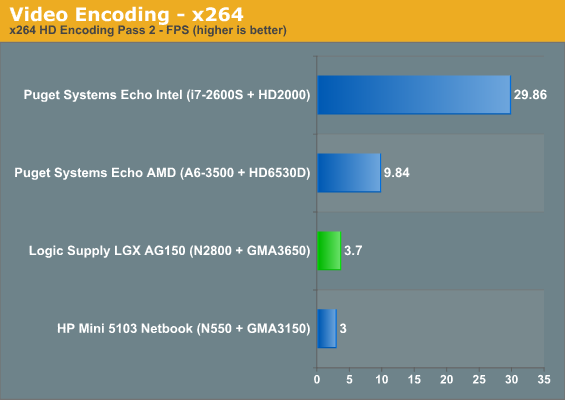 The Intel based GMA's though have typically provided Linux support. While Intel also supports initiatives like the Tizen OS. Fortunately, Intel will be going back to their own GMA with the next generation ATOMs. I was just looking at Logic Supply's website. I'm not surprised that they sent you guys a "new" platform for testing since they have no reason to do anything other than push their existing customers to upgrade, but I am surprised that they only offer a single AMD fanless solution when they're still offering Core 2 Duo ones. I can almost see a case for seemingly offering mobile C2D (I didn't double check but I was assuming these were the ones that had the onboard GPUs from nVidia) instead of Fusion in their Linux systems as well if only because Apple (indirectly) got away with it but... I simply couldn't find a product on their website that made sense to me from top to bottom, or which even more importantly actually made sense to buy from them instead of someone else. The msi products, for instance. Of course now that I've considered all that at least it finally makes sense why they approached you guys about doing a review that's not even aimed at enthusiasts let alone consumers in the first place. Latest graphics driver I found for Atom Nx00 is v8.14.8.1077, dated 2012/06/03. "Despite being the third generation of Atom processor from Intel, performance per core and per clock has essentially stood still since the very first Atom was introduced, and it continues to do so. Other than the single-core and dual-core models, Atom is about making a very small, inexpensive, low power x86 chip. The 32nm shrink that the N2800 represents is all about reducing power consumption further still, which is how we can get two x86-based cores with a combined TDP of just 6.5 watts. Unfortunately, there's a rub. 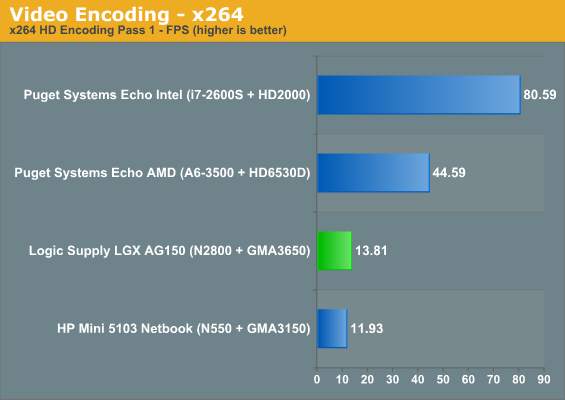 ... Intel was having problems getting the GMA 3650 working properly in Windows. " All this, IMHO, simply reinforces my point all along regarding ARM vs Intel. Yes, Intel has astonishing logic and process engineers. But they cannot change the fact that the full x86 package (and that is what Intel has decided Atom will ship with) is insanely complex. It took 7 years to move Nehalem from idea to shipping product, and that's only going to get worse.